With all the buzz about social networking sites many web site owners are feeling compelled but confused about how to take advantage of the marketing opportunities afforded by getting their business on-board. However, there are a few common misconceptions that should be cleared up and some fairly significant mistakes many are making. "I must quickly post about my business on Social Sites"
No. You have a web site for your business already - what you want is for other people to talk about your business on social networking sites and thereby encourage others to visit your actual web site. So you may want to post about your business on social networking sites but only after you have all your other marketing in order. Social networking shouldn´t become a second place for business information which will sap your time from updating your actual web site and dilute your information. Always update your own web site first. "I want people to find me on Social Sites"
Actually no, what you want is people to talk about you there. If someone is actively searching for your product, organization, or service they will still use a traditional search engine to find you. What can happens on social networking sites is more tangential: People will talk about experiences they have had and share things they liked, potentially encouraging someone who is not even looking to visit your web site to see what they are talking about. 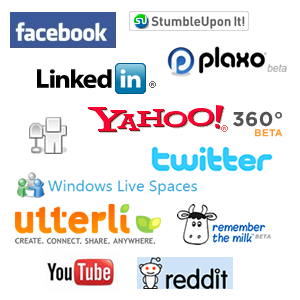 So what you really want is a lot of links from the social networking sites back to your web site. One of the best ways to get that is to encourage people to share the content already on your web site and to continually create more and better compelling content that they will want to share in the first place. So, how do you take advantage of the current social networking fad (and yes it is a fad) without falling prey to the myths and mistakes? Content is still key! You need to continue to create useful content on your own web site that people can then share with others. Sharing links to other places, re-tweeting for example, really isn´t helping to market your business. It drives people to those other places, not to you. So, first and foremost focus your efforts on your business site and then encourage people to discuss it on social networking sites. Second make it very easy for people share the content from your site thereby creating links FROM the social networking sites back to yours. Finally, remember that social networking sites are a bit of a fad - there is huge momentum at present but this won´t last forever - yes get on the bandwagon, but it´s not a miracle cure - nothing is - so you still need to keep up with your regular marketing efforts.